The Irish Horsebox Bar Hire team have converted a traditional Rice Horsebox into a bespoke high-quality bar. We can provide an exclusive drinks experience at a location of your choice to your wedding guests e.g. traditional locations such as Church courtyards to a civil ceremony in a back garden, at Hotels or even on a beach. You name it, we can be there! Our uniformed team will deliver a professional drinks experience to your guests served from our bespoke and unique converted Horsebox. We have prescribed drinks packages e.g. Prosecco and various Gins. However, we are an agile business and your special day is important to us so we can tailor make a package to your requirements. We also have the option of our Horsebox Bar being hired out as a Dry Bar i.e. you stock the Horsebox Bar with your alcohol, we supply the condiments and serve the drinks. We can work with your Hotel by supplying our Horsebox Bar for them to stock their alcohol and use their staff to serve the drinks. If you want the Horsebox Bar at your event, we can work a way to make it happen! We understand that alcoholic drinks may not be your ‘cup of tea or coffee!’ No problem, we can set up our Horsebox to serve exclusive coffees, teas and hot chocolates. We have a commercial Nespresso coffee machine with a menu of specialty coffee pods displayed in a presentation box for your guests to choose. These coffees are served in high quality Nespresso recyclable cups and complemented by biscuits. This option has been very popular of late for wedding guests to have a hot drink in the church yard whilst waiting before the ceremony or even after as photographs are being taken. If our inclusion on your wedding day itself does not suit, then we would be a perfect choice for the traditional day two back at your home. 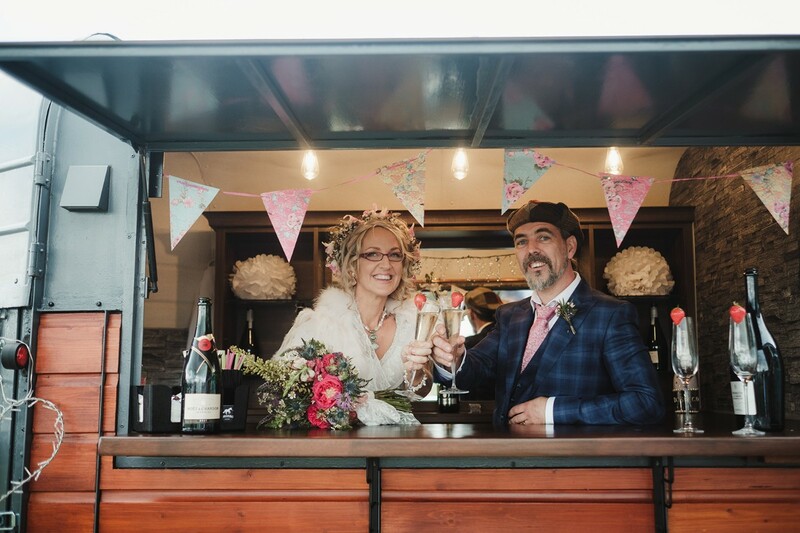 We can complement your day two celebrations with our Horsebox Bar taking away the stress of serving drinks to your guests, let us do that for you! We can also tailor make a package for your Hen event such as a Gin Tasting whereby we will cater a package to include a number of different Gins, Tonics and condiments to taste or alternatively for the stag event, this could be altered to Whiskey Tasting. A quirky option again adding a special touch to your celebrations. Highly recommend these guys for any event! They really complimented the relaxed, rustic vibe we were going for and were the perfect addition in making our wedding day so special!! We went for the processo reception option, straight after our outdoor ceremony and it was a lovely opportunity for our guests to mingle, chat and start the celebrations! They really were a talking point among lots of our guests, and helped entertain our guests during the time we were getting some pictures taken and before our guests were seated in the marque. Great photo opportunity for the wedding album too! The Irish Horsebox Bar Hire definitely have that extra sparkle and are such a lovely professional team to work with, who worked quietly in the background and setup before and removal afterwards was done so efficiently! Thanks so much Sharyn and Dave. We thoroughly enjoyed being part of your wedding day.